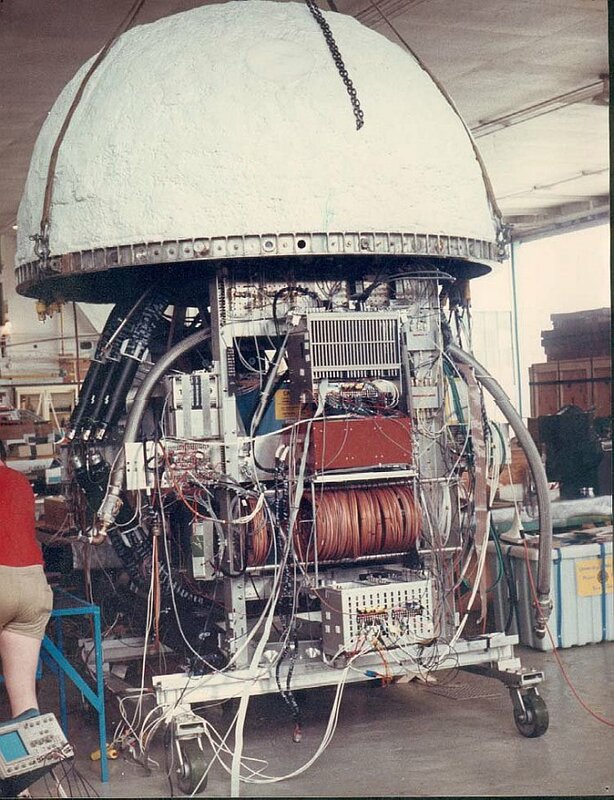 The PBAR balloon-borne magnet spectrometer was built and flown to investigate the spectrum of cosmic ray antiprotons at energies below 2 GeV. Since previous measurements were unable to identify particle species, a consortium of several universities undertook the construction of PBAR to employ the rigidity-time-of-flight technique to measure particle masses at low energies, and using the rigidity Cherenkov technique extended the dynamic range of the instrument allowing measurements at higher energies. The drawing at left illustrates the PBAR instrument. Scintillation counters S1 and S2 measure particle charge (via pulse height analysis of the photomultiplier tube signals) and time of flight (TOF). The drift tube array (DT) resides in the room-temperature bore of a high-field split-coil superconducting magnet, shown in cross section. Together they comprise the rigidity (R) analysis system. In addition to providing TOF information, the scintillators also perform the important task of charge identification. At the bottom of the instrument, the Cherenkov counter (CK) provides additional velocity information. All these elements together completely characterize a particle traversing PBAR, providing momentum, mass, charge, and sign of charge. The TOF scintillators S1 and S2, were of modular construction and separated by a baseline of 150 cm. S1 consisted of three modules, while S2 contained two. Each module was composed of a fast plastic scintillator "slab" with active dimensions 100 cm x 25 cm x 2.54 cm. A photomultiplier tube (PMT) viewed each end through a bent twisted triplet lightpipe. The rigidity spectrometer system consisted of a drift tube tracking hodoscope located in the uniform field region of a two-coil superconducting magnet. The cryostat design, allows particles to pass through the uniform field region between the coils without penetrating dewar material. The magnet produced a maximum field of 15 kG at the center of a cube measuring 20 square cm located within the cylindrical room temperature bore of the cryostat. The cryostat holds 290 liters of liquid helium, allowing the magnet to be operated for near 100 hours between cryogenic refills. The magnet and cryostat weigh 375 kg. The drift tube array consisted of 1.27 cm diameter spiral wound plastic tubes, with a nominal wall thickness of 30 microns, each with a 20 microns diameter gold-plated tungsten wire strung down its center. The tubes resided within four precision machined 1.27 cm thick aluminum plates which, in addition to holding the array accurately together, also served as gas flow manifolds. A mixture of 50% argon and 50% ethane flowed serially through the 323 tubes at a pressure slightly above of the ambient pressure. While early PBAR design concept called for a silica aerogel Cherenkov radiator in combination with an air-filled light integration box (LIB), subsequent difficulty in obtaining the aerogel (that year the factory producing the material was destroyed in an explosion) led to choose water as radiator. In addition, LIB must be watertight and of great structural integrity, since the water radiator is quite heavy (100 kg) and subjected to a 10g shock at parachute deployment. The PBAR trigger, was designed to accept any charged particle which traverses S1, S2 and DT. For an event to be digitized, each of the top two and bottom two drift tube layers must have contained a hit tube in coincidence with at least one S1 phototube and at least one S2 photo tube. A total of 319 such channels were operational during the PBAR flight. The high voltage divider circuits were housed in custom-built metal boxes each containing 32 channels of divider circuitry. Data acquisition and experiment control were performed in flight by an on-board DEC LSI-11/23 computer. The digitized data were sent to a custom-built pulse code modulation (PCM) encoder which buffered the incoming data and converted it to a serial PCM bit stream which was then transmitted to a ground-based data acquisition station to be recorded on tape. During operation, the acquisition system made environmental and diagnostic information available in real time, including continuously updated histograms of scintillator and Cherenkov pulse heights and TDC timing distributions. It also monitored critical environmental and performance data and could sound an alarm to the system operator if such a "watched variable" went out of its preset nominal operating range during instrument operation. The entire instrument was housed in a spherical aluminum gondola shell covered by an insulating urethane foam layer painted white. The final spectrometer configuration had an aperture of 72 cm2. 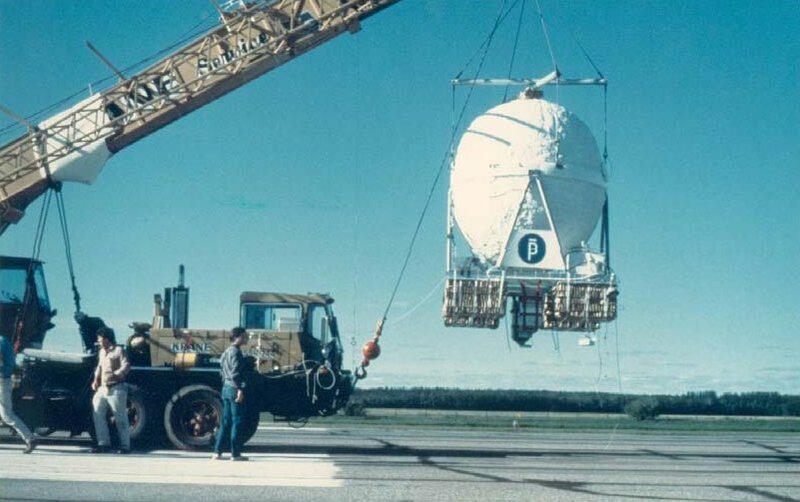 PBAR was launched from Prince Albert, Saskatchewan on the evening of August 13, 1987 at 2:02 utc (8:03 PM local time) by dynamic method using a crane as launch vehicle. After an initial ascent phase, the balloon flight achieved a float altitude of 36 km, which was maintained 10 hours and 30 minutes, of which near eight hours was actual data acquisition "live time". At float the latitude varied between 53°18'N and 54°23'N, while the longitude varied between 104°55'W and 108°04'W. Pbar was the first to employ modern methods of particle identification (time-of-flight vs. Rigidity) to separate antiprotons from other particles and continuous tracking to reject scattered protons. During the flight no low energy antiprotons were observed. Subsequent experiments utilized this same technique to push the sensitivity even lower and have finally measured the antiproton flux at low energies. A search for low energy cosmic ray antiprotons Ph.D. Thesis California Univ., Berkeley. A water Cherenkov counter sensitive to nonwaveshifted ultraviolet Cherenkov photons Nuclear Instruments and Methods in Physics Research 252(1): 112-118. Limits on the antiproton/proton ratio in the cosmic radiation from 100 MeV to 1580 MeV Astrophysical Journal, Part 1, vol. 349, Jan. 20, 1990, p. 78-90.